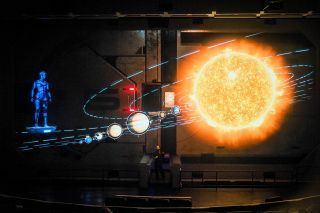 Fans are lining up to visit and revisit “Mass Effect: New Earth, A 4D Holographic Journey” at California’s Great America theme park in Santa Clara. Based on EA’s “Mass Effect” sci-fi videogame franchise developed by BioWare, the 4.5-minute ride combines 3D LED technology with 3D audio, motion seats, environmental effects, and an on-stage performer to create a dynamic experience that’s been hailed as a new benchmark in immersive attractions. 3D Live (www.3dlive.tech), specialists in immersion and 3D, partnered with Electrosonic on the project, which features 3D Live’s patented high-resolution 3D LED panel that delivers a truly holographic experience. Electrosonic installed a full-range audio system for the new ride and installed and programmed its video playback and show control systems. “Mass Effect: New Earth” has been custom designed for California’s Great America by 3D Live and Cedar Fair. 3D Live brought in Halon Entertainment to manage the game engine animation portion of the ride. Guests, wearing passive 3D glasses, sit in an 80-seat Action Theater with 3D Live’s 60-foot, 4K 3D LED screen in front of them and 80-channel surround sound enveloping them. An actor playing Conrad Verner captains the audience’s ship, which travels alongside the main starship, Normandy, through a mass relay to the planet Terra Nova. Guests’ MedialMation motion seats are outfitted with leg pokers and neck ticklers as well as wind, water, smell, and vibration effects. Electrosonic Design Consulting facilitated the concept—schematic design with a focus on facility impact, system control, and audio distribution design. The engineering and operations teams then provided backbone project support through to the end. Chief among Electrosonic’s tasks was installing a full-range audio system with a QSC Q-SYS Core and QSC speakers providing the surround sound control 3D Live required. The Q-SYS acts as the DSP for the attraction; it has the ability to play 80-plus channels of audio synchronized with video. A QSC Touch Mix 16 digital audio mixer is the mixing interface. 70-plus QSC speakers fill the Action Theater, exitway, and queue, including four QSC dual 18-inch subs. “We also worked closely with Crescendo Designs, providing more than 20 four-channel RDL distribution amplifiers connected to 85 custom mini-array nearfield railing speakers to deliver almost 4D sound effects,” said Electrosonic senior project manager Matt Sweeney. Electrosonic also furnished a Shure wireless mic for the live actor and theater and queue QSC paging stations. Electrosonic installed and programmed a 7th Sense Delta Infinity II server to support 3D Live’s content, media processors, and proprietary 3D LED screen. An additional input card enables the server to be adapted to another source, such as a PC for a PowerPoint presentation in the theater space. Electrosonic supplied four newly released Samsung all-weather 55-inch displays and Premier mounts, along with four BrightSign media players for playback in the queue. A Medialon Showmaster control system offers master operational and maintenance control of the audio, video, effects, motion seats, power doors, and lighting SSCs. Touchscreen operator panels are used daily; touchscreen tablet control is also available for maintenance and system checks anywhere in the Action Theater.